I was recently fortunate enough to road trip down to New Orleans a few weeks ago with some friends and some relative strangers. While the drive was a bit elongated and cramped, it was worth it. New Orleans was an interesting town to see. It had its highs and lows, as every trip does. The highs included a lengthy first night on Bourbon Street that included a stream of Snapchat videos streaming from my cell phone and a kayak adventure through the Pearl River Swamp (a few pictures from the swamp on my film blog). The lows included an energy sapping sunburn and the seemingly endless tourist trap that Bourbon Street actually is. I always seem to forget how uninspiring it can be to try and create photos on vacation while everyone else is taking photos at the same time of the same thing. It just saps the energy right out of me when I put up my camera to take a picture while my travel mates simultaneously pull out their iPhones to do the same. In the end, that seemed to shut down my photo-making drive. I think all of these photos are from the same evening. Most nights I didn't want to take my camera out for fear of consuming too much alcohol and damaging it. This night, though, was the first night I felt drained by the sunburn I earned paddling through the Pearl River Swamp. 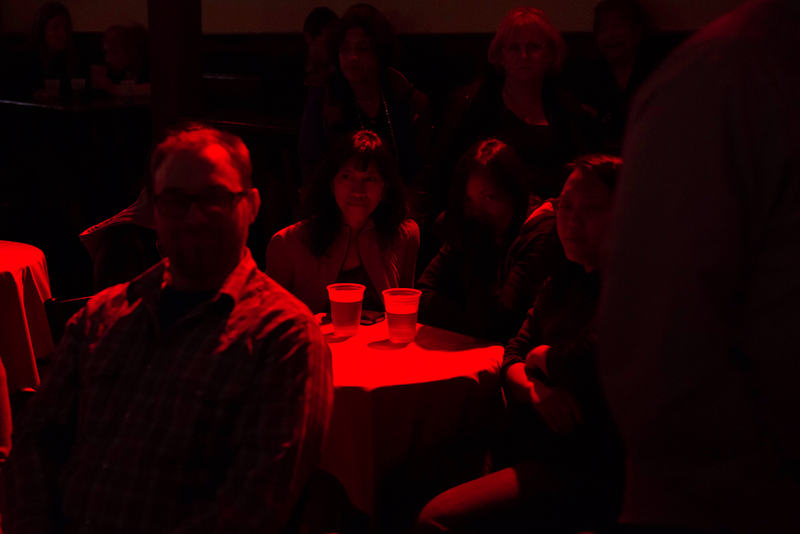 I decided to keep alcohol consumption to a minimum and work on some low-light shots and video instead. 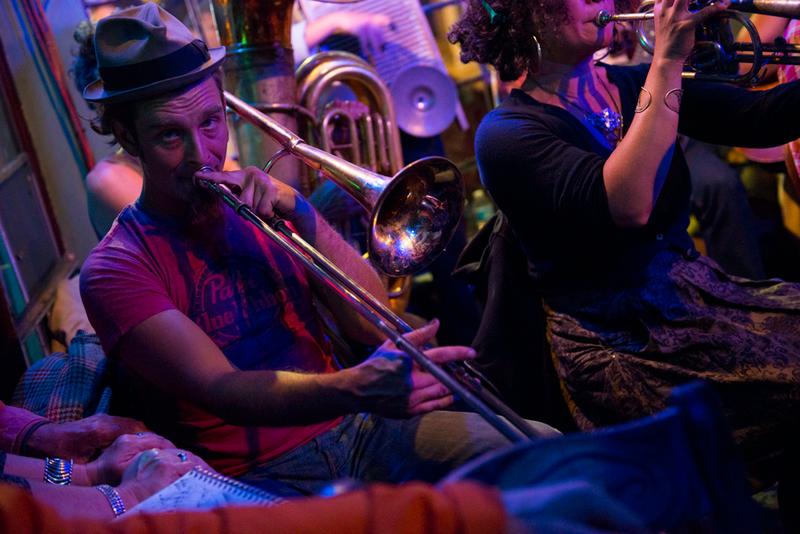 I haven't made a short clip from my video yet, but here are my photos from the night on Frenchmen Street. P.S. 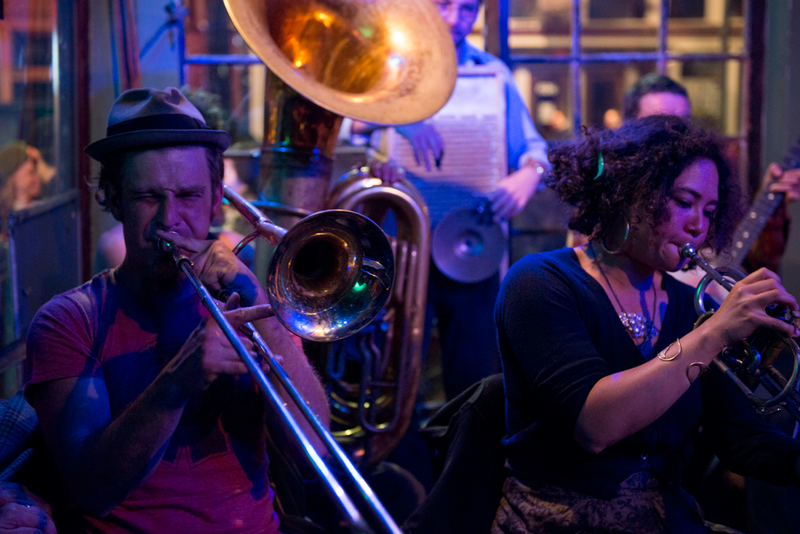 If you're ever in NOLA and looking for Frenchmen Street, don't Google it. We learned that the hard way, taking a long drive to a dark street which nearly ended with us jumping the tracks at somewhere other than a railroad crossing. In short, it's a short skip and a hop from Bourbon Street. 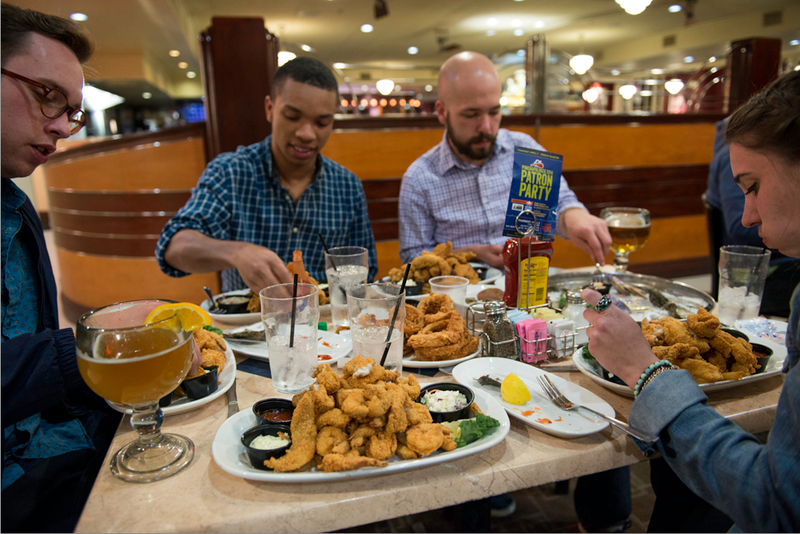 The most expensive, filling dinner I've ever eaten: Shrimp, catfish, oysters, and onion rings... and some fries at Deanie's Seafood in New Orleans, LA. 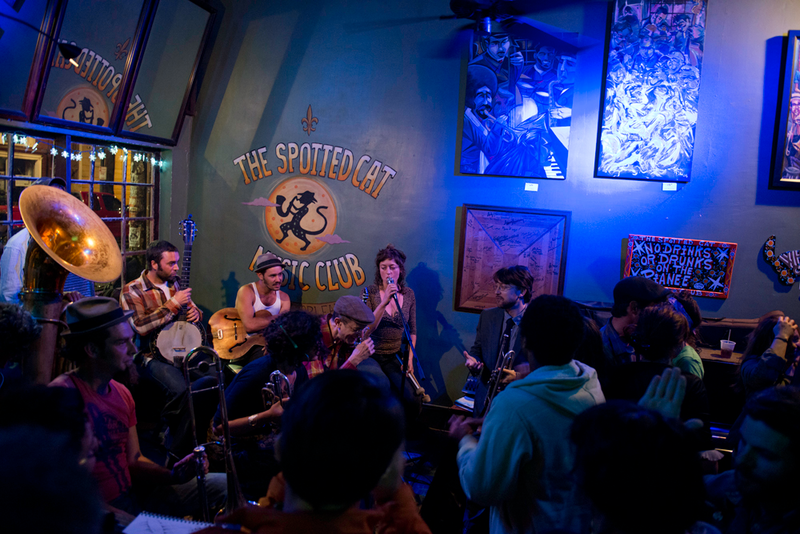 The Spotted Cat Music Club, Frenchmen St. in New Orleans, LA. 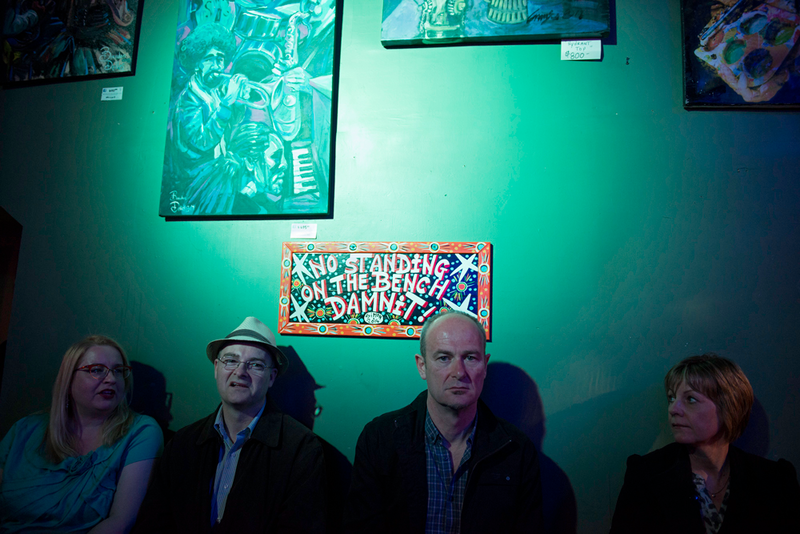 Patrons sit on a bench while taking in the live music inside The Spotted Cat Music Club on Frenchmen St. in New Orleans, LA. Schnelle and Kholood putting some wear on the dance floor at The Spotted Cat Music Club on Frenchmen St. in New Orleans, LA. 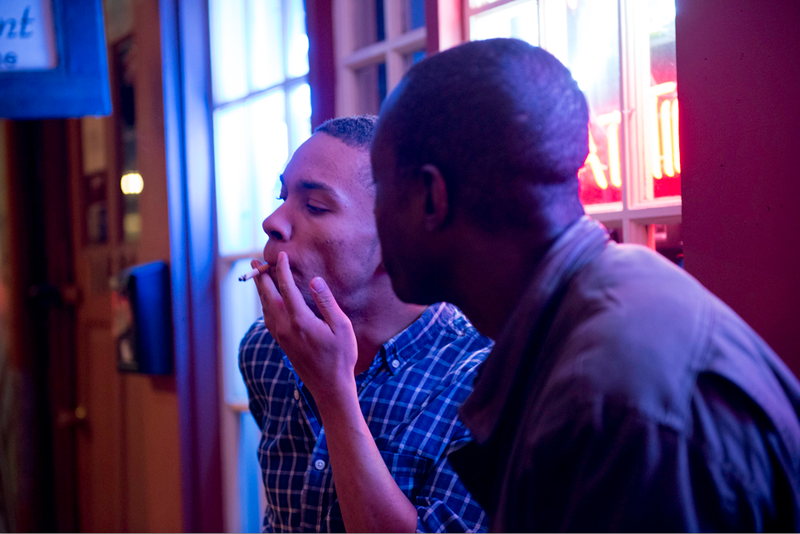 Carl takes a puff of his cigarette while doling out life advice to a man on Frenchmen St. in New Orleans, LA. 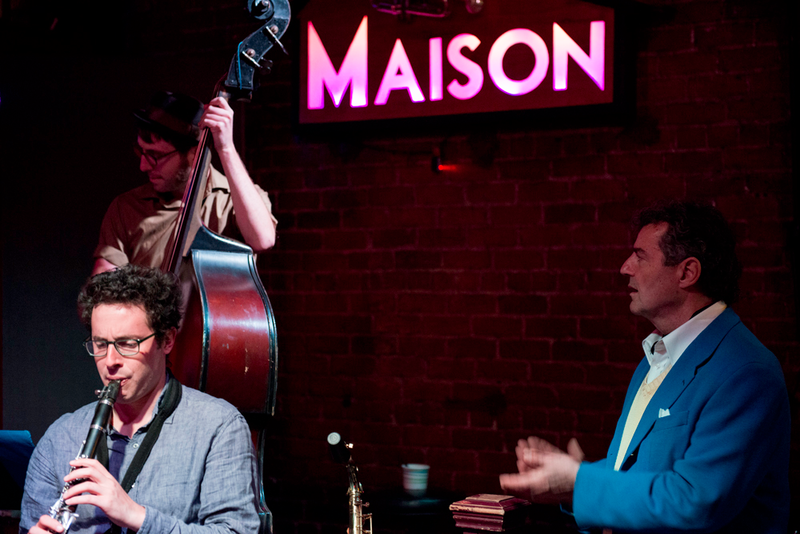 A man traveling from bar to bar claps to the music at The Maison on Frenchmen St. in New Orleans, LA. 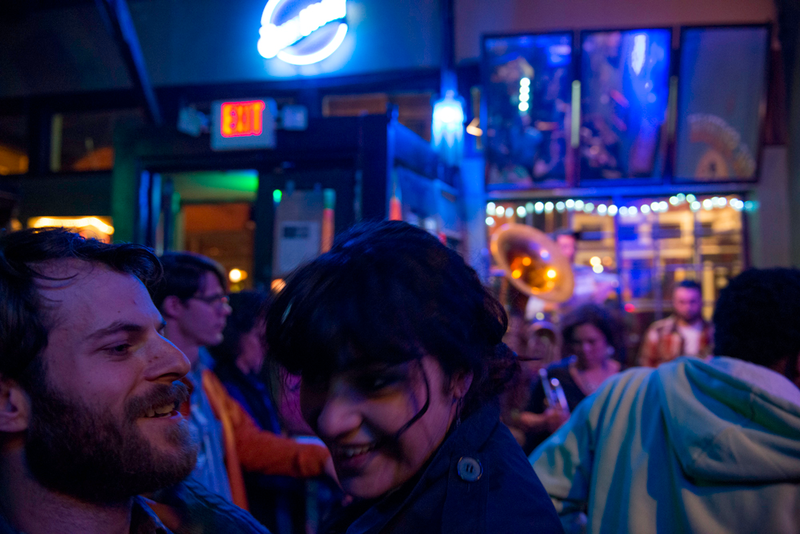 Three women take in live music and drinks at The Maison on Frenchmen St. in New Orleans, LA. 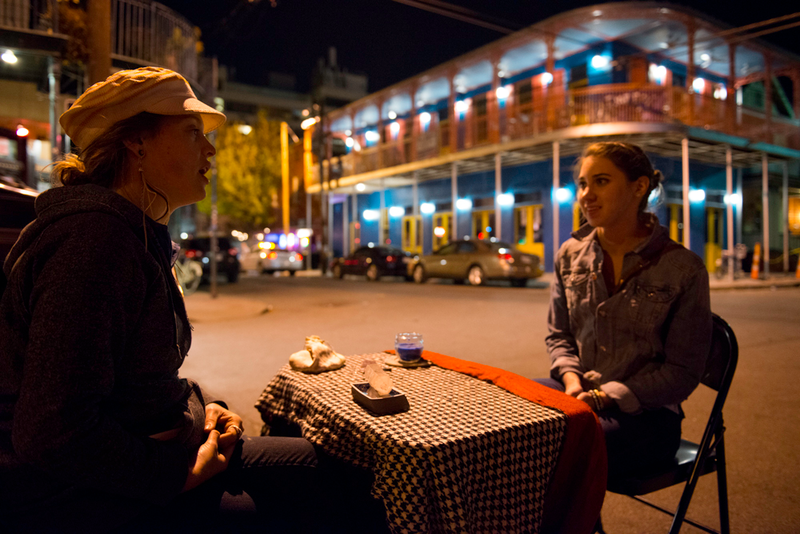 Clare receives an energy reading from a fortune teller on Frenchmen St., New Orleans, LA. I would follow suit later. Thanks to Carl, Nick, Chris, and Clare for putting up with the overly sunburnt 23-year-old tag along.